Packing up your entire home into a few pannier bags, strapping it all to the bike and embarking on the eternal path of world cycle touring takes quite a bit of planning. Even then, the real proof comes when you are actually on the road. Certainly, not all equipment is what they say it is, but then again sometimes you are pleasantly surprised. Any equipment that has a dual role in your traveling and camping lifestyle, normally gets to stay. 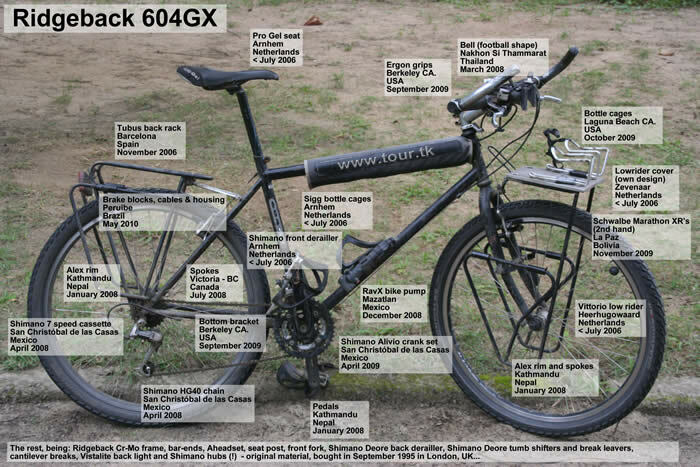 On the next pages you will find reviews of some of the important, and not so important possessions, we took along for our world cycling tour. We review them as we go, so these pages are continually updated. If you would like to know more about bike and camping equipment, clothing, tools or travel electronic gear, then feel free to send us a mail. We'd love to hear from you. Both mountain bikes (chrome molybdenum steel frames) were bought in London in 1995/1996. Son is pushing a Sunn Vertik 2 and Ali a Ridgeback 604GX. The Sunn, a super slick and lightweight machine of just 11.4 kg, is equipped with Shimano Deore LX rapid fire gearing system and Shimano STX hardware. The Ridgeback has Deore LX thumb-shifts and Deore hardware. Neither are top of the range, but have worked perfectly for the last thirteen(!) years and are low maintenance. Furthermore, all the equipment is accessible world wide and therefore easy to repair (by us). No state-of-the-art disk breaks or equivalent luxury. Far too vulnerable in the middle of nowhere. We are still pleased with our choice to take our old, trustworthy, bikes. The fact that we were used to them, they are steel and we can go with the motto: 'if it ain't broke, don't fix it' confirms our initial reasoning behind taking the Sunn and Ridgeback bikes along. If we could do it all again, we'd get the luggage eyelets welded solid before leaving. Between both our bikes we have had 5 snap off. So far all eyelets have been successfully re-welded. But at least they could be welded: everywhere in the world. Son has installed a stainless steel Tubus low rider on the front and a Tubus Logo Expedition at the back. The lowrider needed to be adjusted to withstand several years of bags hanging on it and since her front fork didn't have any screw holes in it to keep the lowrider in place, we originally thought clamps would do the job. Unfortunately, they just didn't work. So we had its welded and put a piece in between; it's very sturdy and it looks great too. Better than the real thing! 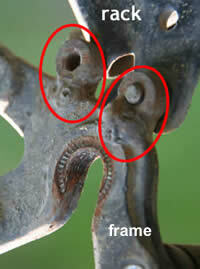 In Sary Tash, Kyrgyzstan, Sonya's Tubus back rack was welded to the main frame of the bike (unintentionally) after both attachment eyelets on either side of the bike frame broke off completely (see follow-up below). If you plan to go on a long trip, checking your eyelets (the small rings on your frame where you connect the racks) should be the first thing you look at before you set off. Letting your local welder put some more solder on the connections won't hurt at all. We have had these connections welded and re-welded several times now, on both our bikes; in Portugal, Kyrgyzstan, South Korea, Belize, Peru and finally the Netherlands. Ali has a Tubus Logo Expedition on the back and a Vittorio steel low rider on the front. He bought the Vittorio because it has fixed top piece where the battery and inverter can rest on. Additionally, here they are out of the sun underneath the handlebar bag. All that was further needed was for Ali to design a sort of platform for all the gear; Wiba Tools in Zevenaar manufactured it. After we abandoned the solar-panel experiment (see bike-touring-equipment-electronics), we replaced the mounts on the top piece with two bottle cages to hold our two 0.6 liter fuel bottles. We started off with Schwalbe Marathon tyres and bought several replacements on the road. We are now cycling on brands that we can find locally. We carry a foldable Panaracer as a spare. Size of the tyres is (most of the time) 26x1.75. It has been necessary to buy 26x1.95 or even 26x2.10 because of the availability in some countries. It seems that 26 inch is the way to go, no problems finding tyres and tubes in this size virtually anywhere. We have tubes with Schrader (or car) valves for a couple of reasons. Firstly, because you can purchase these tubes nearly everywhere in the world. Secondly, you can pump them up with air everywhere too: at petrol stations, tyre establishments, bike and motorcycle repair shops. This valve is truly universal! And last but not least, once you have the car valve fitted, then the hole in your rim will accommodate all other tube types in an emergency. The other way around just doesn't work. *1 We had some major problems with Schwalbe Marathon tyres in Central Asia. The beading snapped on three tyres within 1500 kilometres. We did get replacements free of charge from Schwalbe when we got to Japan, but unfortunately these didn't last that long either. Roughly 5000 kilometres per tyre, which we think is quite poor, considering the price. *3 We now have used the Panaracer for more than 6000 kilometres. It still looks really good and has hardly worn at all. We keep it as a spare, since it is foldable. We think the Panaracer can go a long way! It cost US$ 35... so we still need to get some kilometres out of it. *4 We put our first Cheng Shin's on in Santiago Ixcuintla, Mexico. Son has cycled 8325 and 10709 km on them respectively and they only cost us € 4 each ! Incredible ! We have since bought more of these CST Travellers and although they haven't lasted as long as the first pair (Ali used them as well), they are still incredibly cost-effective. Under a euro per 1000 km! *6 Pretty heavy tyres but walls are too flexible. We used this as a spare for a while, but got rid of it when we found some decent replacements. Not recommended. *9 Our score is based on price, comfort, puncture resistance and durability/longevity. So our conclusion is, that we are going to buy whatever we can get along the road, as long as it's cheap! You might get a few more punctures as it is rare to find Kevlar coating on the inside of your tyres, but it saves you lots of money. + The pair of Cheng Shin Tyres we bought for Son in Santiago Ixquintla, Mexico, have lasted 8325 and 10709 kilometers respectively. They cost us € 4 each and Son has had five flat tyre! The handling is great and they even perform quite good off-road. The ones we bought later didn't last as long, but were still great value for money. Giant tyres were probably second best so far, considering where we were traveling (China, Pakistan via KKH, India, Nepal, Thailand, Malaysia, Japan) and the amount of traveling we did on them. And they were only US$ 10 each when we bought them in Kashgar. Do not buy Bontrager Connection, dangerous. If you're trying to find a Schwalbe or Continental tyre, or looking for a Giant or Merida dealer, here are four maps with the countries in which these brands have distributors. Click on the names on the right to switch between the brands. Click on the map to find out their contact details. (these are distributors, not bike shops! Ask the dealers where you can buy the tyres). 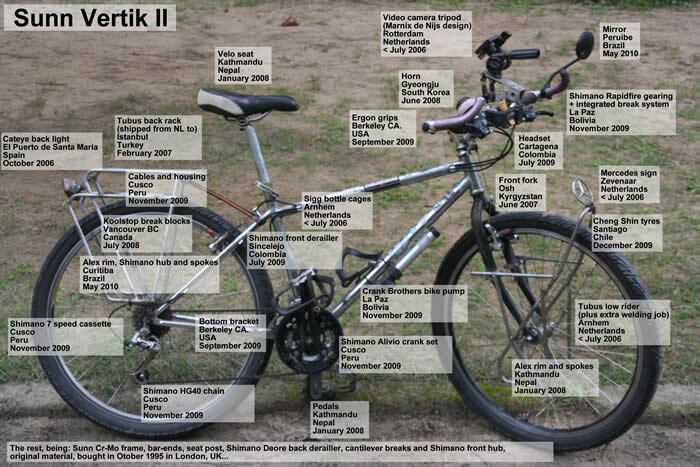 For bike shops, check out the individual country information pages on this site. Bike maintenance is a fact of life on the road, so to keep everything maintained, we bought a Topeak Alien ll tool (the ultimate tool for road and mountain biking (according to Topeak and Ali)). Even though it has a total of 26 functions, Son is not convinced. She prefers good ol' spanners, allen keys, screwdrivers and of course the irreplaceable multigrip tool. The Topeak Alien II is a very nice tool indeed. I would recommend this tool to anybody. It has everything on it for basic repairs should something happen to you on the road. And it is small and compact. The only disadvantage is the movability bulky grip at times: not being as small as a single tool, the repair jobs in a hard to get at spot are more difficult. But it is VERY strong. You'll brake your screws, before you break your tool. On our bike maintenance course, we saw the need to purchase this little tool from M-gineering even though at the time we didn't quite understand how to use it. Secretly, we both hoped that situation would never arise. While it did seem a lot of money for a piece of alloy that fits in your palm, we know now the full value of 'the next best thing'. Every fool can now remove their back cassette to replace a broken spoke, should they want to, but honestly every touring cyclist should have one of these or a similar product in their bicycle tool kit. For safety reasons and because it's compulsory in a lot of countries bike helmets will be going along for the ride. When necessary Son adorns a Giro Skyline and Ali a Bell Delirium. For keeping up with travel distances, heights conquered etc, Ali's Ridgeback has a VDO bicycle computer, type MC 1.0. It's a wireless cycle computer with integrated altimeter. In total 22 functions. The MC1.0 is remarkably reliable. I bought it a few years before we actually left on our world trip, so I could get used to it. It has let me down only once, when the transmitter stopped working. This was due to the cold and the snow that we were in at that time. In general, it does seem to work less reliably in very cold weather, but that is likely to have something to do with the battery as well. But anyway, a replacement transmitter was sent within a week (no charge and a 5 year guarantee). Ortlieb pannier bags are strong; have good handles for carrying upstairs; the locking system is durable; and above all, they are incredibly waterproof. The only, and very annoying, disadvantage of Ortlieb bags are the little black clips that go into the hooks, so they fit all rack sizes. (Son's bags are the older type Ortliebs; they don't have clips and therefore fit perfectly on the Tubus racks - lucky Son!) The clips fall out constantly and even gluing them in doesn't last forever. The only solution is to throw away the clips and put a band of tube and/or tape on the racks where the panniers go. This way, you won't need any more clips, nor have to carry any spares and your bags won't come off by accident or a bump either. See tip of the month June 2007. As of August 2010 we are using two Big River dry sacks, courtesy of Sea to Summit. The material is more flexible and the bags come in funkier colours too. Although we were a bit sceptical in the beginning whether the bags would stay waterproof, they have held up nicely and kept all the gear inside dry. 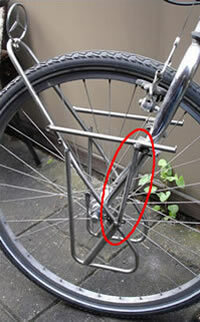 They have handy loops on the sides, for easy attachment to your bike via bungie cords. When we set off we used two Ortlieb Dry Bags (1x PD350, 22L. 1x PD350 35L.) to keep the sleeping bags and tent dry. They fit nice and snug on top of the back panniers. There is absolutely no worries with choosing any of the Ortlieb dry bags on offer. After a few years on the road, they needed to be replaced, due to quite a few holes in the fabric. Strange thing to mention, but bottles never last a very long time. So you should have bottle cages that fit all types of bottles. We didn't know the Sigg bottle holders were not big enough to hold any other bottle (marketing ploy no doubt), so when we needed to replace all but one bottles (one leaking due to wear and tear and two split open due to frost), we could not fit them in properly. Only because the bottle cages broke, do the other bottles fit, but that is not how it should be of course. So buy a standard size bottle cage and forget about those Sigg's.